If you are interested in using the full version of Outlook instead of Web Outlook from home or off-campus, you can connect to the college’s Remote Server (Terminal Server) and use any of the Microsoft Office programs available there, including Word, Excel, PowerPoint, Access and Outlook. Additionally, while connected to the remote server, you can map your network drives just as if you were sitting at your office desktop computer. 1. Go to Start > All Programs > Accessories > Communications and open Remote Desktop Connection. 2. In the Computer: field, type nvcc-remote3-v.nvcc.edu and click Connect. 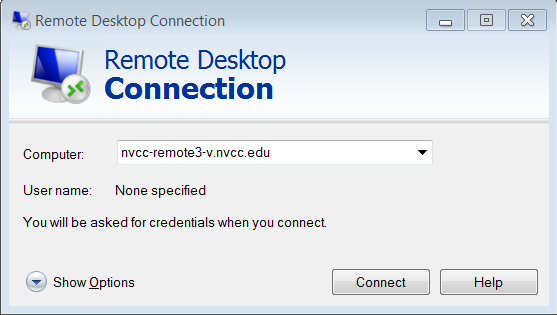 Note: nvcc-remote1-v.nvcc.edu and nvcc-remote4-v.nvcc.edu are also available. 4. 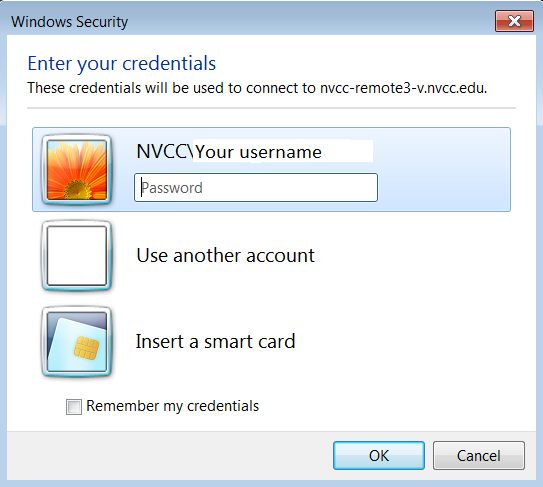 In the dialog box above, then type in: NVCC\your username. This will be the same username one that you use on your computer at work. Enter your normal password and click OK.
5. Once you are signed in to the Terminal Server, you will find the Microsoft Office programs under Start > All Programs > Microsoft Office. Refer to the section on Mapping a Network Drive to learn how to map to the G: and H: drives once you are connected to the Terminal Server.